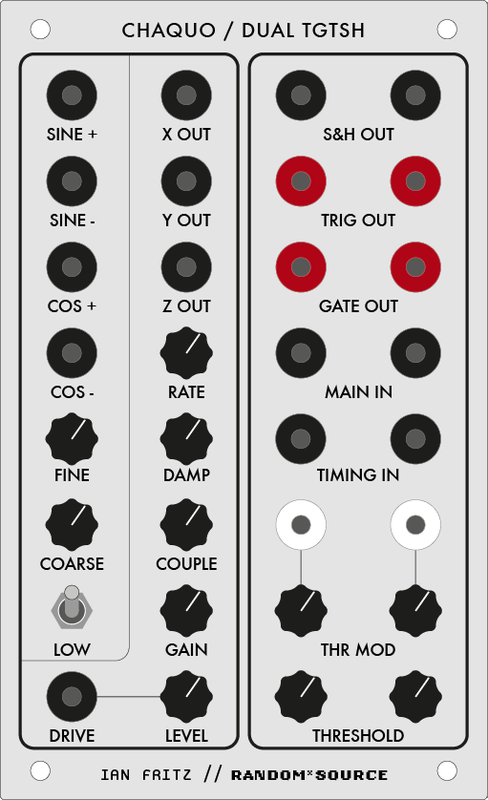 Classic lowpass gates based on the Buchla 292C plus the amazing timbre wavefolder module of the Buchla Music Easel adapted to 12V and Serge signal levels. 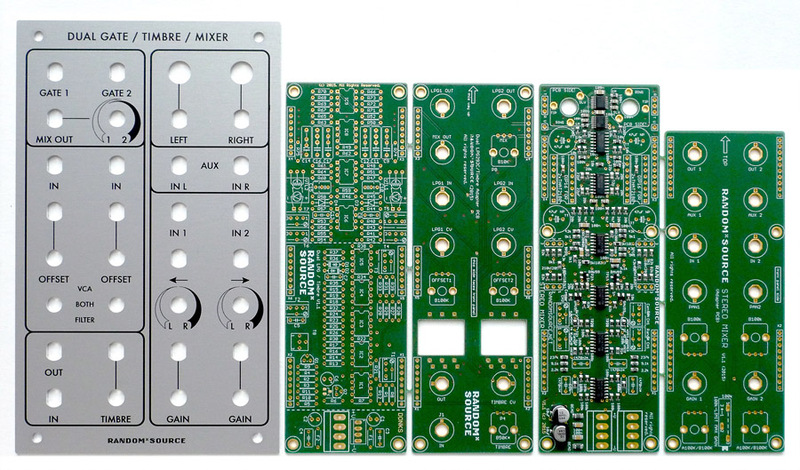 1 R*S Stereo Mixer 1.3 pcb set (2" wide) with all SMT components (including balanced line drivers, Burr-Brown op-amps) reflow soldered in - only very few through-hole components (THAT2180s, audio capacitors, trimmers ...) have to be added. New version 1.3 - NJR MUSES edition! 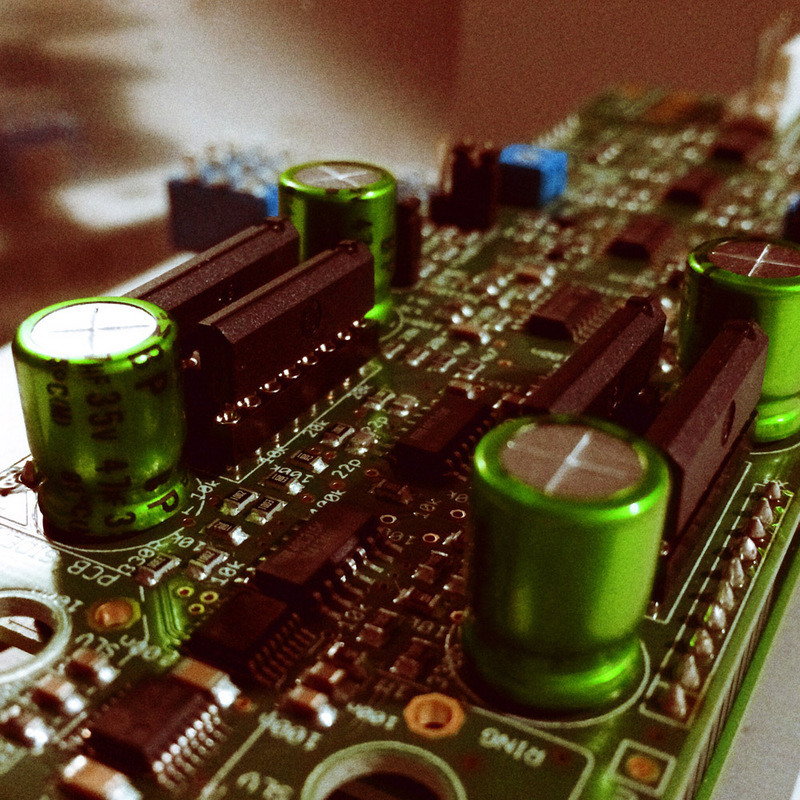 Please note that only the Stereo-Mixer pcb is SMT, the LPG pcb is through-hole. 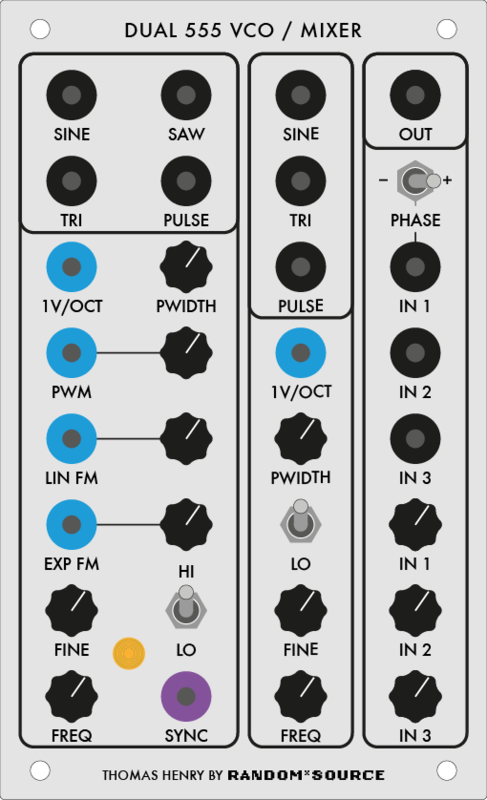 This module combines some of essential Ian Fritz modules: a versatile chaotic signal generator, a sinusoidal quadrature oscillator and the well known TGTSH, a dual Threshold / Gate / Trigger / Sample / Hold Circuit. The TGTSH provides two important synthesizer functions: it produces trigger and gate signals whenever a "timing" signal input crosses a user-defined threshold. At the same time, the trigger pulse fires a high-performance sample-and-hold circuit that samples a second "main" signal input. 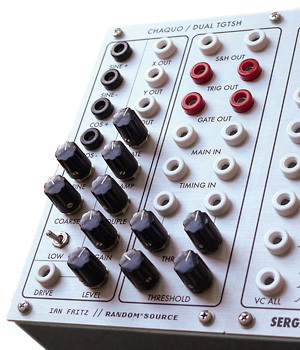 The Chaos Generator is an analog electronic simulation of the classical driven double potential-well problem, with the addition of extra gain in the circuit loop, and an extra cross-coupling path to extend the range of chaotic patterns available. The double-well system is a second-order system and therefore requires an external driving signal. This is provided by quadrature oscillator. 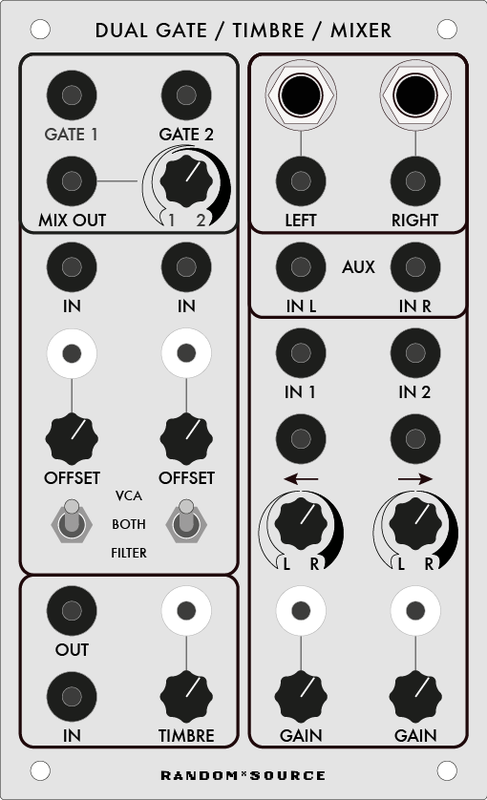 Chaos Generator and Quad Oscillator can be used together or separately. Thomas Henry's 555 VCO is probably one of the most precise analog VCOs ever, featuring ramp, triangle, pulse and sine outputs, sync, linear and exponantial FM, pulse wave modulation etc. Might be the best tracking VCO around. 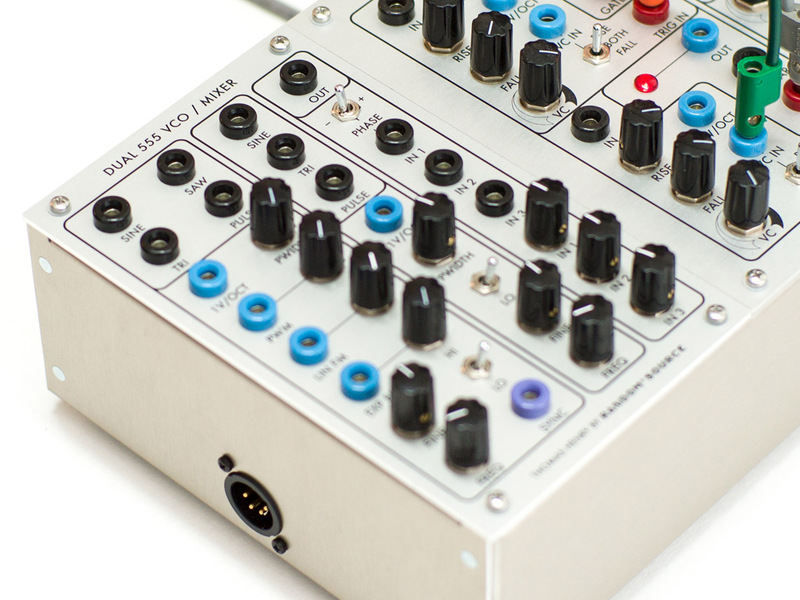 Here's what Thomas Henry said about his design: "My favorite VCO of all times is the CEM3340, and I've always wanted to approximate it somehow. After nearly thirty years, I finally have a design which comes the closest. " 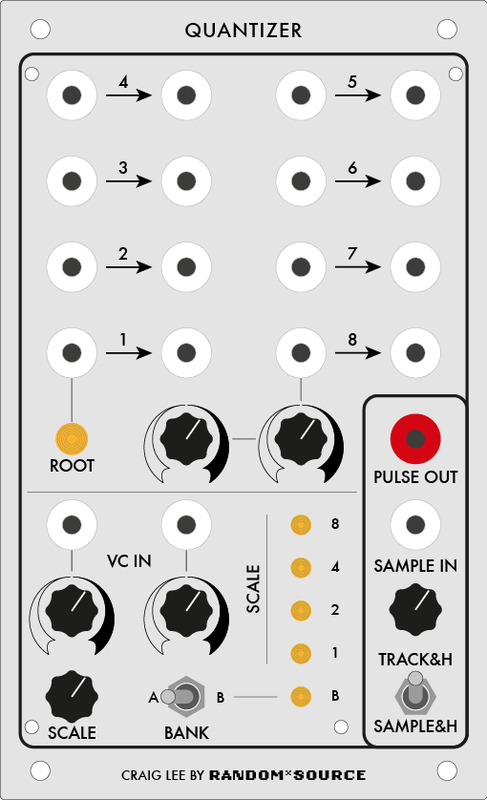 Need some Dim, Blues or Java in your modular life? The CLEE Quantizer features 8 independent channels of quantizing which share common SCALE. BANK and HOLD/SAMPLE AND HOLD controls. More info on Craig Lee's Quantizer page. Please note: Random*Source currently offers the front panel (4U) only - for a version 2 of the CLEE pcb - you need to get the pcb separately from Craig via his website. There's no component pcb (yet)..
More Modules on the Serge 4U Module page.